Race ready 2012 DR S97 kart w/Yamaha KT100 engine (52.10) blueprinted and maintained by TS Racing. Includes spec WKA exhaust pipe, L&T 2 disc dry clutch and MyChron 4 - 2T Gauge. 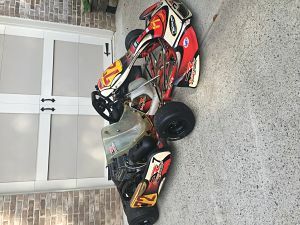 Owned by 55 yr karting vet. Package includes over $2,000 of spare parts/equipment. Everything you need to go racing. 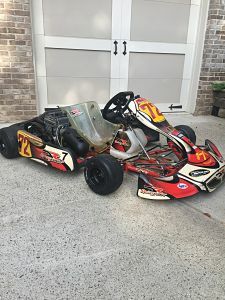 Spares include rolling kart stand, Coleman starter, mag wheels/tires, rain wheels/tires, rear hubs, 10t L&T clutch, blueprinted carb, engine TCI, 4 hole can WKA exhausts(2), sprockets(73-89t), Sparco kart cover, Turbo tire changer and bead breaker, etc.